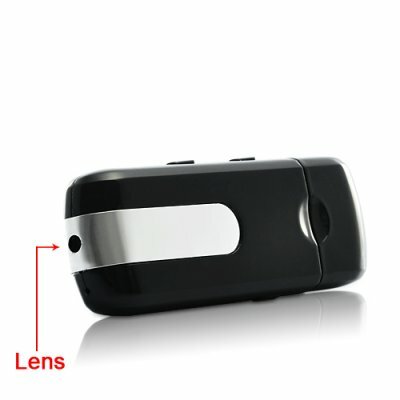 Successfully Added USB Flash Drive Camera DVR with Motion Detection (4GB) to your Shopping Cart. USB Flash Drive Camera DVR with Motion Detection: a secret gadget in the form of your usual storage device! Introducing this wonderful USB Flash Drive Camera that records video, image and audio, has motion detection feature and stores up 4GB of data! It looks and works like your common USB flash drive, but this great gadget has a perfectly hidden pinhole lens that takes high quality digital video at up 30 frames per second and clear 1600x1200 resolution photos in JPG format without arising suspicion. It is as easy as pointing and shooting. Once you start recording, data is stored directly to a micro SD card for convenient playback on any device. This USB flash drive camera is great for skilled and novice secret agents and even comes with motion-detection activated recording. Just leave it ON and it will automatically record only when there is movement in front of the lens. Ideal when you are away of your desk and to know exactly who has been through your files! Upgrade your surveillance and ing means right now with this outstanding USB Flash Drive Camera. Brought to you at a factory direct wholesale price by your best source of innovative gadgets, Chinavasion.